“I think she’s like the bus in the movie 'Speed.' If she slows down too much, her mouth explodes with stupidity." "The Daily Show" host mocked Michele Bachmann's claim that Huma Abedin, Hillary Clinton's long-time aide, may be linked to the Muslim Brotherhood. Michele Bachmann didn’t make many friends when she recently claimed that Huma Abedin, Hillary Clinton’s long-time aide, may somehow be working on behalf of the Muslim Brotherhood, and Jon Stewart was no exception. Stewart’s jeer comes a few days after the Republican Congresswoman and four of her Republican colleagues called for an investigation into Huma Abedin, Secretary of State Clinton’s Deputy Chief of Staff, implying that she may be linked to the Muslim Brotherhood. Mocking Bachmann’s claim, Stewart threw to a chart detailing Abedin’s link to the Muslim Brotherhood: Abedin’s father founded the Institute of Muslim Minority Affairs, which had the support of the former general secretary of the Muslim World League. The Muslim World League, in turn, was closely aligned with the Muslim Brotherhood. “That is f------ air tight!” the late night show host said sarcastically. Stewart proceeded to apply the six degrees of separation theory, to see whether Bachmann could be linked to Islamic extremists. 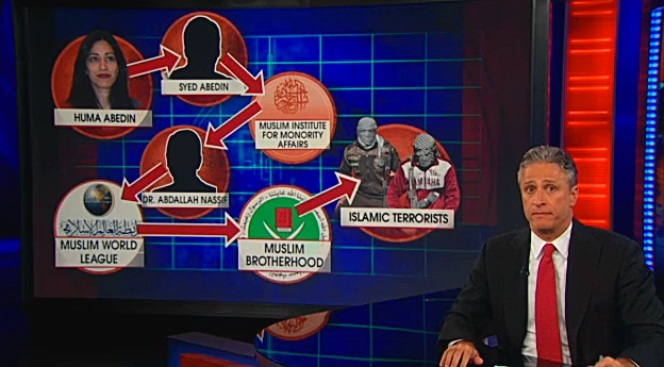 Addressing a new chart, Stewart illustrated how Bachmann could in fact be linked to al-Qaida: with a 2008 HSBC North American campaign donation of $1,000. “Maybe there should be an investigation,” Stewart quipped.